In a new series, Clare Balding is walking for self-improvement. In this programme, she joins a walking book group in North London who feel that rambling aids literary criticism. Clare Balding is walking for self improvement in this new series of Ramblings; in six weeks time she hopes to be smarter, fitter, calmer and cleverer. 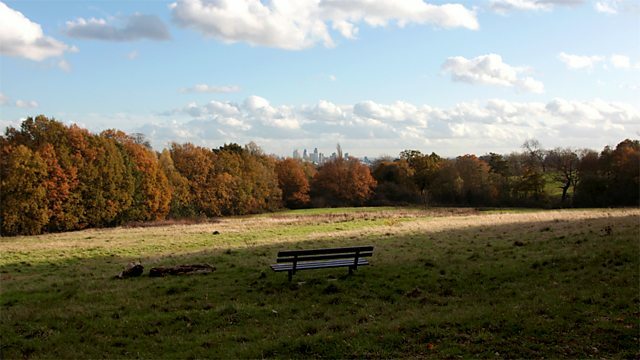 In this first programme she joins a walking book group in North London, who find wandering on Hampstead Heath much more conducive to discussing literature than sitting round a coffee table. The walking book group is the brainchild of Emily Rhodes from the local Daunt book shop.Emily explains to Clare how she chooses the books each month and why she thinks the group attracts a growing and enthusiastic following. The book under discussion today is Elizabeth Taylor's Mrs Palfrey at the Claremont. Clare, an English graduate, joins in enthusiastically with her opinions on the novel as well as discussing with fellow group members the issues of aging, loneliness and retirement homes. Archie, her Tibetan Terrier accompanies Clare but is sadly, not improved by the experience.